First of all, let me start by saying there is no such thing as ‘the correct approach’. 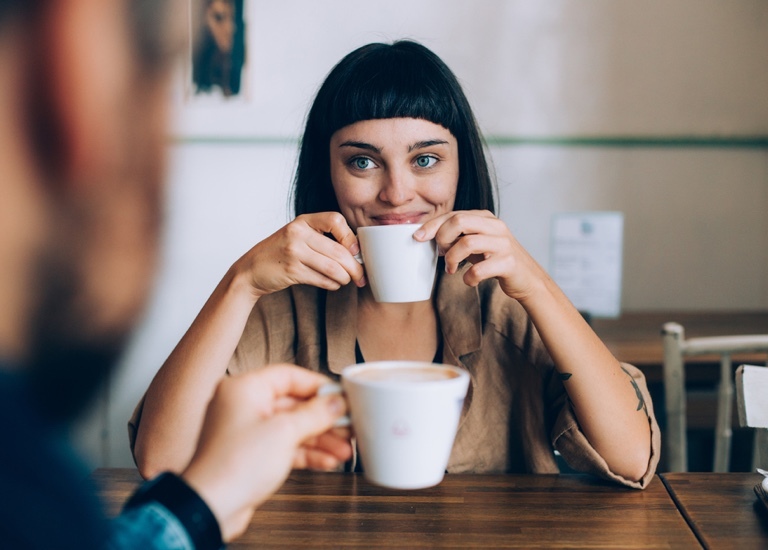 Everyone will approach online dating differently, according to their own personality and their own style of connecting, which is a good thing. You want to meet a real person right? Not a robot who does everything correctly. Now the person asking the question in this case is specifying it with: ‘How should one approach being invited/inviting someone out to coffee, for the first meeting etc. It seems there can be high expectations on a first date’. Aha! Expectations. So this is a question that goes a little bit deeper than inquiring about the practicalities of dating. Here is someone looking to not hurt someone else’s feelings. Which is admirable in itself, but a little complicated when dating. If not impossible. Because when you are dating, if you are doing this genuinely and are open in meeting others, getting to know their heart, you may end up hurting someone despite your best intentions. Because only when you are really open and actively involved will another person get to love you. And when you end up not loving them back, which is possible, this will hurt them. If you don’t want to hurt other people’s feelings, then don’t date. It’s as simple as that. If you don’t want to reject, then don’t accept a date. You can say you are dating with the intention of leaving the other person better off, which is all great and admirable, but it is also slightly impossible when you think about it. Sure, they will learn and grow even when being rejected, but they will not feel better off on the short term when you reject them, only, hopefully, on the long term will they see how your rejection was needed in the process of them finding someone better suited. Now back to the question. How to approach online dating? By being as much yourself as you can and by meeting up with someone as soon as possible. Don’t exchange more than three to four emails before deciding when and where to meet up. Don’t make things overly complicated. Meet up for coffee, if you don’t like each other, move on. If you do, meet again. Don’t see online dating as a goal in itself, but instead, see it as a means to an end. A vehicle to get you from A (no dates) to B (interesting dates and potentially a partner). It doesn’t matter so much whether you’re on a train, a bus or a car, as long as you reach your destination, right? We travel the channel regularly because we have family and friends in the Netherlands. If the train doesn’t function we take the boat. We would swim if we could, but apparently, that’s slightly tricky (and long and cold and uncomfortable). In the end, it doesn’t matter much how we get there, but that we get there where we want to be. Online dating can be a bit trickier than meeting someone who is somehow connected to you in your network. But challenges are to be faced, not avoided, right? So go ahead and find your approach to online dating, the one that suits your personality and helps you travel from A to B! Are you outgoing and feel like meeting up as soon as possible? Go for it! Are you a bit more shy or introverted and do you prefer to call before you meet up? Ask the other person if they are open for that! Find the way online dating works for you because it has proven its worth to many people in many ways already. And you may be the next person for whom it works!